In place of Microsoft Points, Microsoft adds Rewards Credits and the ability to convert it to cash. "The more you do, the more you get" is the motto of Xbox Live Rewards. With its revamp, members are awarded rewards credits for completing various tasks and, of course, buying games. When users earn at least 5,000 credits, those credits are converted to the user's local currency. For example, in the U.S., 5,000 credits equals $5. You can only earn the reward credits as an Xbox Live Rewards member. Microsoft provides a few examples of reward-earning activity on their Xbox Live Rewards page. Renewing an Xbox Live Gold membership earns you 3,000 credits, referring other people to the program is 1,000 credits, playing a new game for 10 hours within 30 days of its release is also 1,000 credits, making your first Xbox store purchase is 1,250 points, and taking a monthly survey is 250 points. The MyPunchcard system is still in place; when a member completes the criteria associated with an offer, they receive the reward. For example, completing the My Movies and TV Punchcard, a member is awarded 3,000 credits. Building up a gamerscore also earns a three percent Xbox Store rebate. Rewards credits will not be converted to real currency until the you have at least 5,000 credits. Until that point, the amount will be considered as pending. The local currency is deposited into your Microsoft account between the 15th and 30th of each month. 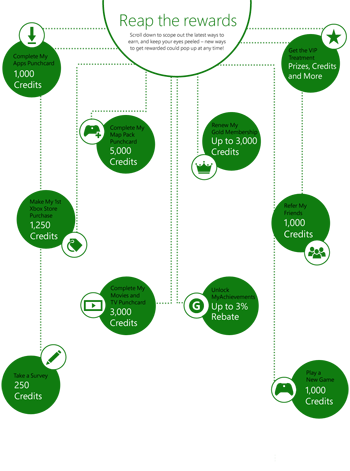 Rewards credits do not disappear, but the cash deposited into a Microsoft account expires in June 2015. Signing up for the rewards program is free and takes a few days to confirm eligibility.